Ireland and the UK couldn’t agree on a final deal. THE PLAN TO build thousands of wind turbines in the Midlands to export clean energy to the UK has been shelved by the Government Minister Pat Rabbitte confirmed today. Ireland and the UK signed a Memorandum of Understanding last year to establish a new renewable energy trading plan but no final agreement had since been signed and the project was thrown into doubt as a result. In a statement released today, Minister for Energy Pat Rabbittee announced that the project will therefore not go ahead. “I regret that it has not been possible at this time to conclude an agreement as envisaged. However I believe that in the context of an European Internal Market and greater integration, greater trade in energy between Britain and Ireland is inevitable in the post 2020 scenario,”the minster said. Economic analysis conducted on the Irish side clearly indicates that under agreed policy and regulatory conditions, renewable energy trading can deliver significant economic benefits to Ireland and the UK, as well as being attractive to developers. Various groups and politicians had objected to the plan, criticising the Government for its scale in particular but the Government and the wind energy industry had estimated that the plan would create up to 30,000 jobs countrywide. A ‘National day of Protest’ is being organised for this Tuesday in Dublin by different community groups from around the country who have expressed concern about the growth of the wind energy industry and how investment is taking place. The groups argue that the turbines are being planned in locations that are too close to homes and impinge of the environment of rural areas in particular. Reports that the Midlands plan was in doubt surfaced a number of weeks ago and the Government has since faced pressure in a number of Dáil debates. 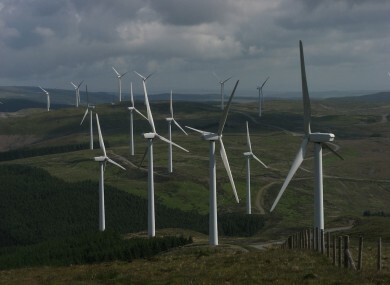 A Sinn Féin bill tabled earlier this week had also sought to place stricter regulations on the development of windfarms. The confirmation that the Midlands export plan will be viewed as a victory by campaigners even if the main issue was the difficulty with securing the final agreement with the UK Government. “Renewable energy trading has to be designed to work, ” said Rabbitte. Following further discussions between my Department and the Department of Energy and Climate Change in the UK since the summit between the Taoiseach and Prime Minister Cameron in early March, I am confirmed in the view that given the economic, policy and regulatory complexities involved, and the key decisions yet to be taken by the UK, delivery by 2020 of a Midlands Wind Export Project is not now a realistic proposition. Rabbitte added that that he has informed his UK counterpart that the Government have decided to drop the plan. The decision to drop the plan has been criticised by the Green Party who say that it is part of a trend that has seen Irish energy politics descend into “short-term, populist thinking gone awry”. “Abandoning the deal with the UK Government to trade renewable energy is going to cost this country dear, ” said Green Party leader Eamon Ryan. One of the biggest benefits was that it could have lowered the cost of electricity here by allowing us balance our variable power supplies across a wider area. We have also lost the opportunity to give the whole country an economic boost from billions in investment. Ryan added that “not a single party in the Dáil which was willing to stand up for renewable power” taking specific aim at Sinn Féin whose proposals last week he said would “kill this natural resource opportunity”. Email “It's official: The Government has cancelled its Midlands wind energy export plan”. Feedback on “It's official: The Government has cancelled its Midlands wind energy export plan”.